Within minutes of this motor appearing on ebay the word went round 'it's one of Ted Vanner's', and so it turned out to be. 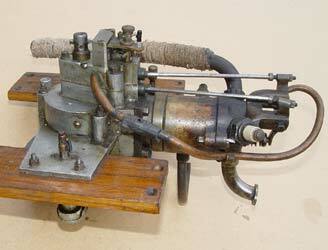 This was one of his very earliest, built to be mounted horizontally with an integral bevel gearbox underneath. 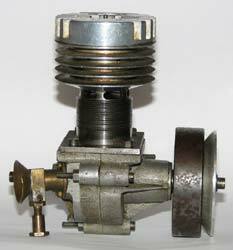 The use of Belvedere Smith castings dates it to well before the first war and originally it had an atmospheric inlet valve. Found in a most odd place! A large model boat turned up on ebay recently, and lurking in the depths of the engine compartment could be seen just a corner of an engine mount and wheel. Nothing to do with the boat, so a deal was done to buy it 'unseen'. 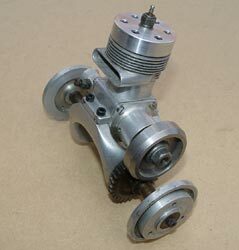 When it arrived, it turned out to be this superbly engineered 5cc rear rotary valve racing engine and mount. Someone obviously took a great deal of time and care on building this motor, but it seems that it was never quite finished. The current plan is to fit an ETA 29 piston and liner to get it running. A complete mystery at present, but a wonderful example of what lengths engineers went to in the latter days of tethered car racing. Proves as well that you can never tell where something interesting will turn up. Probably the most successful 15cc motor of the modern era was built by the late John Rose and is now being run very successfully by his son Mike. 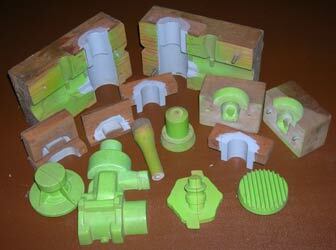 A and B class motors must be home constructed and the starting point is usually a set of castings. 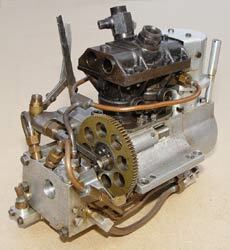 Like all of his motors, large and small, John produced his own castings, and these are the complex patterns and core boxes required to make a schnuerle ported 15cc two- stroke. Thanks to Mike Rose, OTW intends to publish a much more detailed appreciation of the hydroplane racing career of his father, whose B class record has yet to be beaten, 12 years on from his untimely death. Mons Gems Suzor is revered for his contribution to tethered hydroplane racing and the development of two-stroke engines for racing, yet he was active in so many more fields of modelling. He supplied engines for model aircraft, broke the free flight duration record in 1936, produced books and magazines about all aspects of modelling and was equally well known for his steam engines and locos. 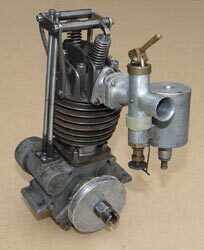 His shop supplied designs and castings for a variety of motors, including this 30cc motor. 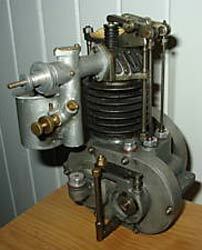 The mounts and carburation indicate that it was not intended for racing, although it has managed to blow a chunk out of the cylinder in true 'boating fashion'. 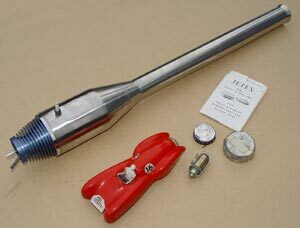 Thanks to Dave Noakes for discovering this item and Eric Offen for the photos. Jul 09. Larger motors, colloquially and somewhat disparagingly known as 'doorstops' have largely steered clear of the excesses of the collectors market. The Grayson shown on the left, and the Stuart AE from the opposite ends of the 1930s certainly disproved that theory. 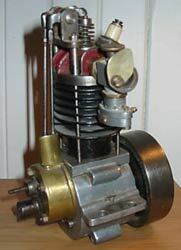 Having seen a water cooled Gannett sell for £330, the surprises continued when the Grayson went for £400. This caused a few intakes of breath and sucking of teeth, but nothing compared to the disbelief and amazement when the Stuart sold for, wait for it, £1420. No doubt a very happy vendor and several very perplexed 'doorstop' enthusiasts. 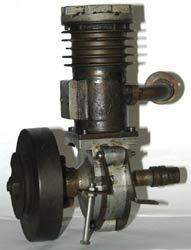 This is the 30cc Atom III that was produced in the very early 1930s and is again reputed to be one of Westbury's own engines from the Bowden collection. Again a relatively long stroke motor, but with rear rotary valve induction. 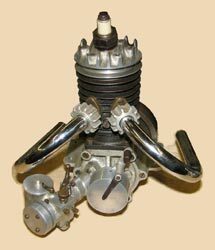 In 1932 Westbury produced a 15cc motor in collaboration with Bowden, called the Atom Minor. 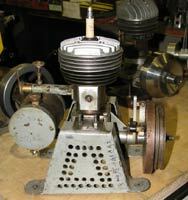 This motor had little in common with the larger version as it reverted to side port induction, more appropriate for model aircraft use. An even smaller 6cc version followed called the Atom minor MK III, again side port and with an integral fuel tank for aircraft use. This original and unfired Bailey pulse jet unit came from a collector in Cornwall along with the 'Worlds Fastest Tethered Car' and associated Jetex unit. Jetex manufactured a whole range of motors powered by solid fuel pellets and an equally large range of car and boat models and kits. The car used its own box as a pylon!